Rhonda Quaney: Who Are You Like? When the girls were still young, we found ourselves in the office of a successful businessman in a local community. He was a kind, gracious soul who extended wisdom and acceptance as if they were nothing at all. On the wall of his office hung a huge portrait of a man unknown to me. The face was accentuated with an elaborate wood frame, complete with intricate scrolling, carved features and gold gilding. Something about the man was familiar. His demeanor was calm. He appeared regal, yet not seeming to be proud. His eyes gentle. Hands relaxed. My friend noticed my gaze and with a sweeping gesture he waved his hand at the wall where the portrait hung. "Do you see that man?" "I did notice him," I answered, a little embarrassed for staring. "This is the man who changed my life," he responded in a matter-of-fact tone. He went on to tell me how as a boy, he lived in a large city, in a bad part of town. At a young age he was associating with people who were already making poor choices. This man, who's picture hung huge on the wall, had seen in my friend what the boy desperately needed to see in himself. It was such a life changing relationship, that he honored his mentor with the portrait on his office wall. I desired to have someone like that in my life. A person who could see in me, what I could not see in myself. A woman who was a beautiful blend of trusted, wise friend yet possessed some of the qualities that I needed to developed. Someone honest, yet encouraging. It was almost too much to hope for. For me, I didn't just need a nice person to invest in me. I needed a woman who loved and lived Jesus. There was a woman in our church who I was drawn to. She was in her 70's, had lived and served in Ecuador for 26 years and lost her husband to cancer. There was just something about her I loved. At first I hesitant to approach her. It seemed strange to just walk up and say, "Hey! Do you want to hang out with me?" I think I was afraid she would reject me, or if we did start meeting that we wouldn't connect at the heart and that would be awkward too. One day I just blurted it out and asked if she would be interested in mentoring me. She was quite surprised that I asked. In her humble shy way, she asked me what I expected from this relationship. I hadn't really thought about that and didn't have any real expectations. I just wanted to hang out with her and hope some of who she was would rub off on me. We did began to meet. It was a sweet thing that I wrote about here. Some of the things that deeply touched my soul from the time I spent with her? She was available. No agenda. Just available. She was young at heart. We laughed like school girls, when on walks, ate amazing food and shared life. She was in the process of writing a trilogy. Seriously how many people can say that?!? I had no idea when we began our friendship. And when I told her I thought I was suppose to write she cheered me on. Just to actually say those words to her was huge. And she believed in my dream because she knew the One who had placed it in my heart. There have been a host of other precious people that have impacted my life and help mold my soul, but Pauline holds a special place, because I desperately needed a woman to show me how to walk a better walk. Someone further down the path in maturity to help me reach for higher ground. Our Pastor is currently preaching on a series and is using a diagram to help illustrate spiritual maturity. All attempts to define such a thing have their short comings, but I appreciate the visual this brings. It is a circle divided into pieces of pie. The first sliver of the graph is when we don't know Jesus, the next is when we come to believe and we are spiritual infants. The visual continues to be separated into toddler, teenager, and adult maturity. He has been teaching how too often we spend years and years in pews and never grown up to spiritual adults. How too many times, we are older yet still acting like children spiritually, demanding our own way, whining about all kinds of things that aren't how we think they should be. There are so many problems when we stay unchanged. One big issue is that we need to be spiritual adults to help "parent" the young Christians and new believers. When it comes to mentoring it's easy to think we could never do that, since we don't have it all together. The fact is that we will never have it all together. We just need to be growing. And no matter where we are on the journey there will always be someone who is younger spiritually than we are and someone more mature than we are. One of my very good friends, who I consider to be a mentor as well, has been a believer fewer years than I have. Since she has immersed herself in the word and has been obedient to what she has learned, I consider her more mature in her walk than I am because of it. The fact that we have sat in a church all of our lives does not determine where we are spiritually. Wouldn't that be easier? And no matter where we are, isn't it time to get moving? Friends, it is critical that we be growing in our relationship with Christ and having a mentor can speed up that process and make it sweeter in the journey. in how to proceed, in who to approach. It doesn't have to be a lifetime commitment. Some relationships certainly are on-going. My experience is that often there are seasons. like a fall or spring season, etc. Express any expectations you have up front. Some women like more formal structure. I like a more organic approach that involves lots of coffee. Mentoring is about relationship. This involves time spent, words of encouragement and acceptance. and the other person always taking. different people to us to invest in and who will invest in us. Mentoring is a fancy word for being a trusted friend to someone. These are just my personal observations. I hope they are helpful as you consider having a mentor and being a mentor. One other thing Pastor John says, is that we take on the spiritual DNA of those we spend time with. When I think of people who I admire, I am gazing into the faces of others who invested in them as well. I am so grateful for the women God has used to help me grow more like Him. Still I know that there is no replacement for time spent in reading, studying and living out the Book He left, for our instruction. The goal is always to be more like Jesus. I realized later what was familiar about the man in the portrait with the exquisite frame. He had the same demeanor as our businessman friend. The one who admired his mentor had now become so much like him. It's a reminder too, that we need to choose carefully who we allow to influence us. 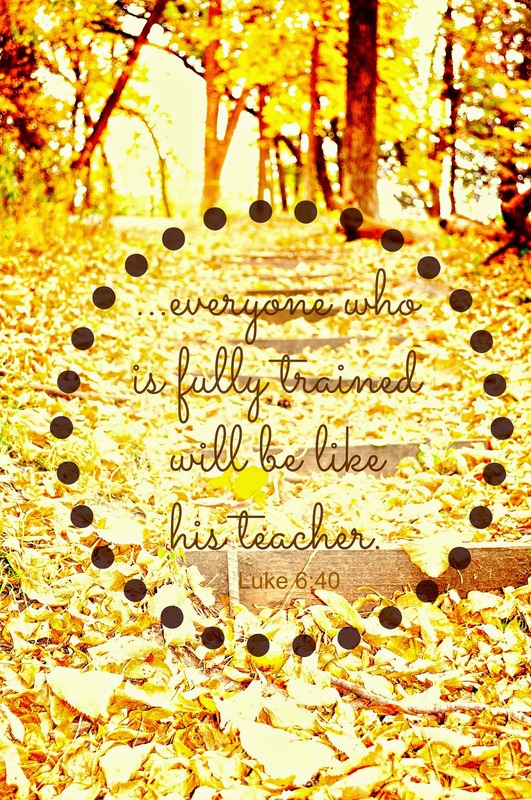 Luke 6:40 says it well, "..everyone who is fully trained will be like his teacher." In whatever season of life we find ourselves in, my prayer is that we would be growing in our relationship with Jesus. Are you a mentor or do you have a mentor? Share your insights or experiences about being or having a mentor?